The colors I chose for this week’s quilt project are making my workspace bright and cheerful, have you had a chance to visit the Northcott Canvas fabric line yet? So far, we’ve sewn together 100 half square triangles and 100 quarter square triangles. Wow! Samples of the different units that will be used to make the quilt blocks. All our hard work will pay off today as we build our blocks and put the quilt top together. 8 blocks will have yellow centers. It’s easy to construct the blocks; we just need to be careful when placing each piece within the blocks. Here’s the layout for each of the color possibilities needed to complete this quilt. 12 with a yellow center. The 3 quilt block layouts to complete the quilt top. We all have our preferred ways to assemble our quilt blocks. I prefer working in rows and on 1 block at a time. You may prefer other methods that work for you. For this reason, I’ll let you assemble your blocks using your preferred method. Do use the above photo as your guide for color placement. To reduce the chance of errors work on one block of 1 of the colorways at a time. When finished move to the next colorway until all are completed. Now that the blocks are assembled, we’ll add lattice strips around each block. The lattice color to use is the same color as the center block piece. For example, if the center block piece is orange, the lattice color is orange. The 2½” X 12½” lattice pieces go along the side edges while the 2½” X 16½” pieces go along the top edges of each block as shown. 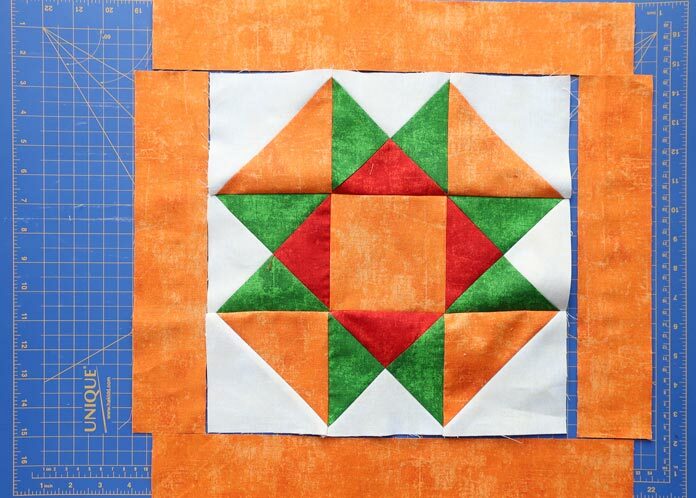 Quilt block layout with orange lattice and orange center block. After the lattice is sewn to all 25 quilt blocks, sew all of the combined lattices and blocks together into a larger quilt top! Click here for the quilt top’s layout. The colors refer to each block’s center piece color. Note:When sewing the blocks together, remember that the shorter pieces of the lattice are on the sides of the block and the longer lattice pieces belong to the tops of the blocks. Keep this in mind when sewing the blocks to each other. 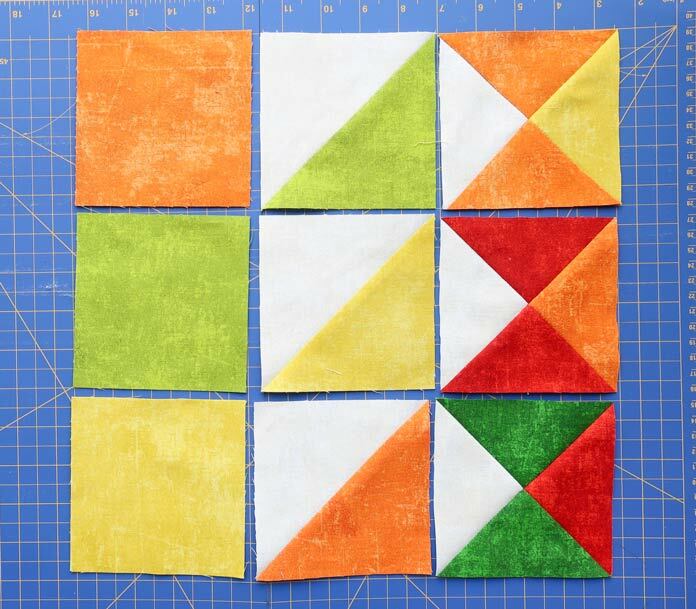 Now that the blocks are sewn to each other, sew your rows together! Once all is sewn, we’re ready for the last step to complete our quilt top: adding the outer border. For this step you need the eight 2½” strips we cut on Monday’s post. Before we can attach the strips to the sides of the quilt we need to sew all the strips together on their short ends. Many quilters use a 45o angle. This method hides the seam better. Use the method you’re most comfortable with. 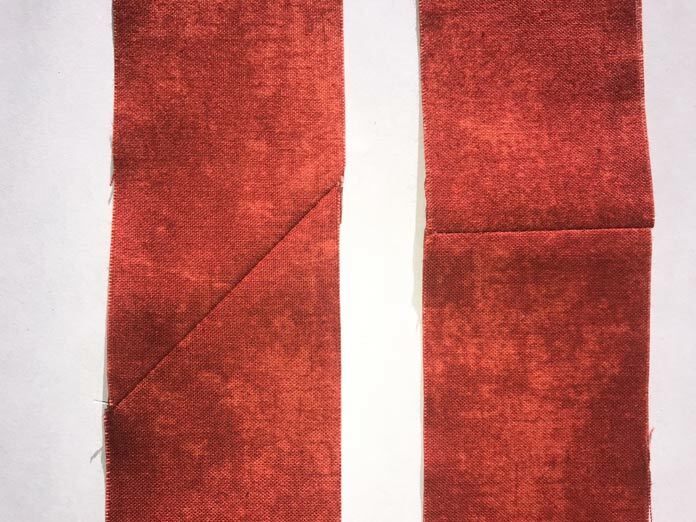 2 methods to choose from for sewing strips together for your binding, choose your favorite. The outer border is sewn to the sides first and then to the top and bottom of the quilt, just as we did for attaching the lattice when constructing the blocks. In four days we’ve completed our quilt top! I hope you’ll love it as much as I do. Tomorrow will be the BIG reveal; the completed quilt. It’s no secret that I love bright colors and I was very happy to see that I was able to find exactly what I wanted in the Northcott Canvas line. Tomorrow, the quilt will be ready for quilting and binding and see how it all came together. I love this pattern and the stars are so fabulous. I’m showing this pattern to my mother. She will love it also.